The Corporate Law and Business attorneys at KALIS, KLEIMAN & WOLFE have been helping South Florida businesses with non-competition, non-solicitation, and confidentiality agreements for more than 20 years. It is extremely vital for a business to protect and retain human resources, intellectual property, trade secrets, and more. Confidentiality agreements can be used to protect business relationships and employment situations. 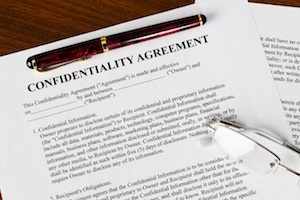 A confidentiality agreement is a contract in which the signing party agrees not to disclose any information about the other party in the contract. Confidentiality agreements, also known as non-disclosure agreements, are often part of employment contracts. Employers will require their employees to sign such an agreement and promise not to disclose information about the workplace. Most confidentiality agreements will specify the period for which the agreement will cover. Some confidentiality agreements have an end date where others may last indefinitely. The agreement is enforceable only if the information remains confidential and if the courts do not deem it an excessive level of protection, which doesn’t need the level of confidentiality stipulated. When a confidentiality agreement is broken, it is often treated as a breach of contract and contract law governs, unless stimulated to otherwise in the contract. It is strongly recommended that you hire an experienced law firm to protect your legal interests, as confidentiality agreements are not foolproof and are often complicated. Our firm has more than 20 years of experience in the areas of analyzing, drafting, negotiating, reviewing and interpreting a variety of employment and contract issues, including confidentially agreements. We can also litigate your employment agreement issues including breach of contract, trade secrets, non-disclosure of intellectual property and more. If you or your business needs help drafting a confidentiality agreement or has another business matter that needs attention, contact the experienced Corporate Law, Employment Law and Intellectual Property Attorneys at KALIS, KLEIMAN & WOLFE, the South Florida-based law firm today at (954) 791-0477.